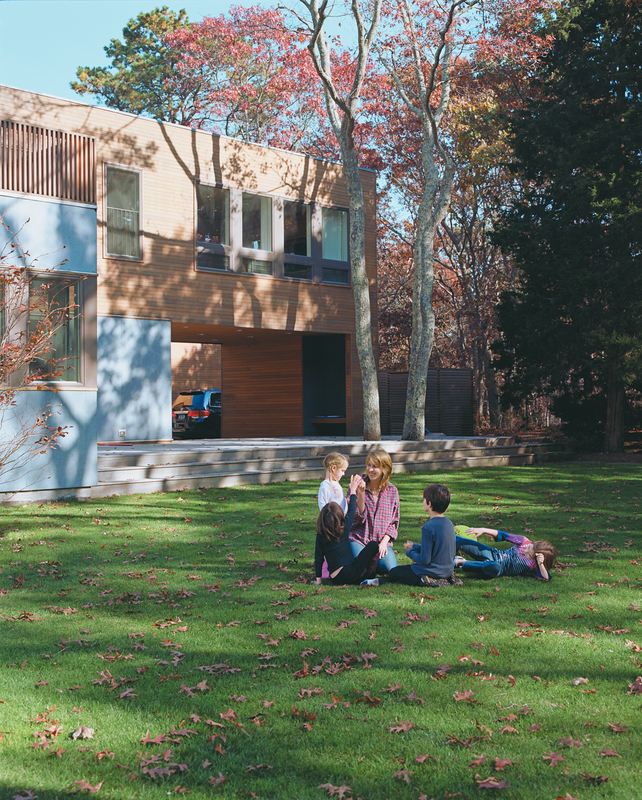 A long house on Long Island, this prefab could get to its site peaceably only by traveling in pieces. Designed by Resolution: 4 Architecture as a holiday retreat for a family of six, this slatty slab is up to the task of sheltering its owners and all their guests. Tanya Wexler and Amy Zimmerman linger in the breezeway designed to draw eyes, and footsteps, from the driveway through the house to the gently sloping backyard and swimming pool beyond. The house was deliberately sited to preserve the two-acre property’s existing trees, three of which can be seen protruding through the surface of a rear deck. Honed granite was selected for the kitchen surfaces because its matte-like finish is easy to maintain and hard to damage. 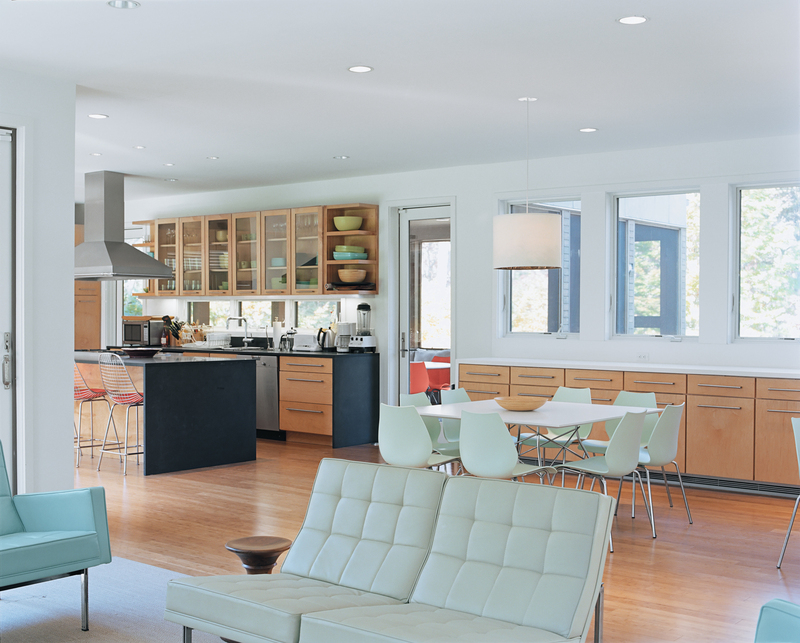 Eight-foot sliding glass doors bathe the kitchen and adjoining living room in ample sunlight. The living room is furnished with Modernica’s Split Rail loveseat and sofa and a walnut Eames stool from Herman Miller. The dining area features Vico Magistretti’s Maui chairs and an Antonio Citterio Glossy table, both from plastics expert Kartell. Architect Joseph Tanney says the house was designed as a safe haven for Wexler and Zimmerman’s children. “A big, long bar cuts off the front, where the cars are, so the kids can just run free in the back,” he says. The four children divide themselves among three Blu Dot–furnished bedrooms and two bathrooms located off the second-floor hallway. The narrow hallway separates an office and television room at one end of the house from Wexler and Zimmerman’s master suite, which sports an Emma Gardner rug and matching Saarinen Womb chair, made for Knoll, perfect for lounging. New York City can be a difficult place to call home. Charming and exhilarating, it’s also dirty, crowded, and punishingly expensive. Now imagine New York with children. Tanya Wexler and Amy Zimmerman share their Greenwich Village townhouse with four of them, juggling birthday parties and play dates with work obligations and other commitments. It’s an exhausting routine, one that frequently leaves them worn out and hungry for a break. Wexler and Zimmerman were more fortunate than most Gothamites in that they had a refuge—a beach cottage in East Hampton, New York, that they bought in 1999, three months after their oldest, now 10, was born. By 2005, however, Zimmerman was pregnant with the couple’s fourth child, and the aging 1,200-square-foot cottage no longer seemed as large as it had six years earlier. The foundation had cracked, creating a nagging mold problem, and the place was only “somewhat winterized,” Wexler says, effectively putting it off limits for months at a time. In their initial discussions with Res: 4, Wexler and Zimmerman found themselves cycling back to one word: indestructible. They wanted a house that could hold up to the wear-and-tear of four young children running around, trailing beach sand and backyard dirt in their wake. “That was a big, big part of our concept,” says Zimmerman. “We wanted the materials to be really durable—able to withstand people coming from the outside, all the sand and stuff.” Caramelized bamboo flooring was installed throughout the house with that in mind, as were the Corian countertop that runs the length of the dining area and the honed granite surfaces in the kitchen. They also wanted both a large space where the family could be together as a unit or entertain guests and private areas where they could go to be alone. Tanney and Luntz responded by giving the ground floor an open layout, with the kitchen island serving as a sort of command center looking out onto an expansive dining and living area. All of it is bathed in ample sunlight that filters through a canopy of mature oak trees before shining through a series of six eight-foot-tall sliding glass doors. For meals, the family can gather around one of two square tables, or push them together to seat 12. A pair of guest rooms is hidden at the end of a hallway. The upstairs is given over to private spaces. An office and a television room occupy the eastern end of the house, separated from Wexler and Zimmerman’s master suite by a long corridor. The four children divide themselves among the three bedrooms and two bathrooms off the hallway. The seven modules that make up the house were trucked to the property and lowered into place by crane over the course of two days in May 2006. 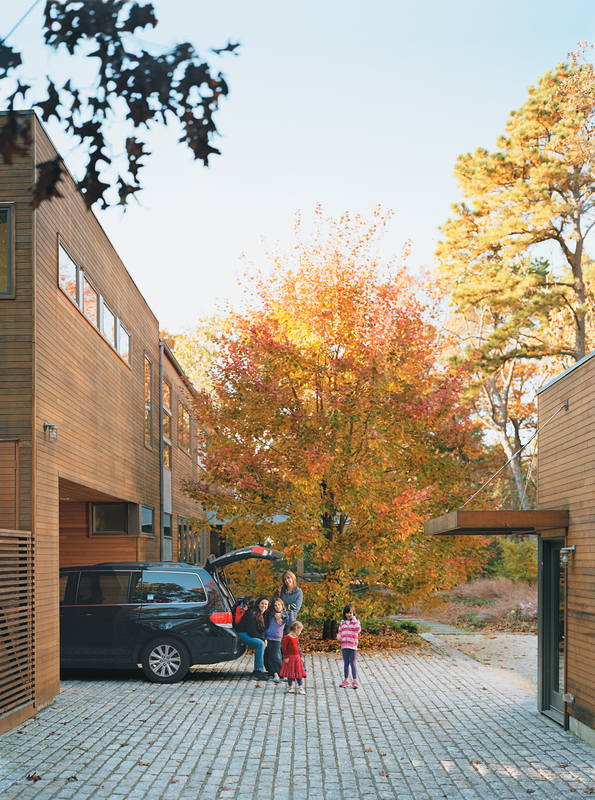 They were assembled and outfitted with cedar siding, effectively creating a 112-foot barrier separating the backyard from the moderately busy two-lane road out front. “The design of the house is a long, linear bar to create a safe haven for child’s play in the back,” Tanney says. The first thing visitors see upon arrival is a breezeway that frames a view of a gently sloping hill leading to a swimming pool and a 200-square-foot pool house, which Res: 4 also designed. The effect is to pull visitors through the opening—past the house and its easy-to-miss front door—into the yard beyond it. The two-acre property was meticulously landscaped by Robin Key, the landscape architect who designed the rear patio and roof deck at Wexler and Zimmerman’s three-story city townhouse. The house—which, at 4,500 square feet, is more than three times the size of its predecessor—was carefully designed around the property’s existing trees. In a clever move, a direct result of a program that implored the designers not to cut down a single tree, one of the two rear decks was built around three tree trunks. Res: 4’s Modern Modular system ended up working for Wexler and Zimmerman because of its limitations rather than in spite of them. In a modern world of endless choices, they responded to a system that gave them flexibility within a framework of relatively strict design parameters and a limited palette of materials. With Res: 4, they created a house that suits their lifestyle—one that a family of six can retreat to whenever the burdens of their overscheduled city lives get the better of them.